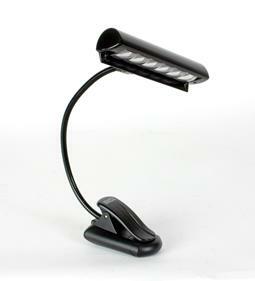 The LED Encore Light is a miniature version of our popular Orchestra Light. Featuring a similarly sleek body design, the Encore's light bar contains six bright white, energy-efficient LED's, along with an integrated back fin to shield the brilliant light from the audience. The Encore's head has a sliding power switch which offers two brightness levels. With a signature Mighty Bright clip and a flexible gooseneck, the Encore epitomizes music stand light perfection. For added convenience, the Encore light comes with an AC adapter and a black Mighty Bright travel bag. Start practicing - with our Encore Light you will be playing long into the night!